The daughter of the thief who killed Spider-Man's Uncle Ben has discovered Spider-Man's secret identity. Despite her emotional tie to her father, she has fallen in love with the man behind the mask. 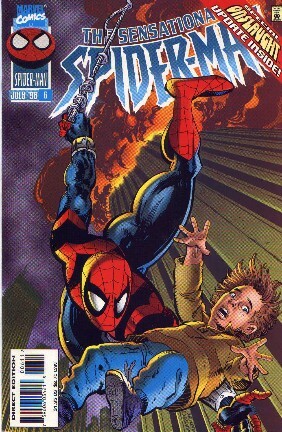 Much of the story is taken from her point of view, as she struggles to decide whether or not to expose Spider-Man to the world. What finally makes up her mind for her? 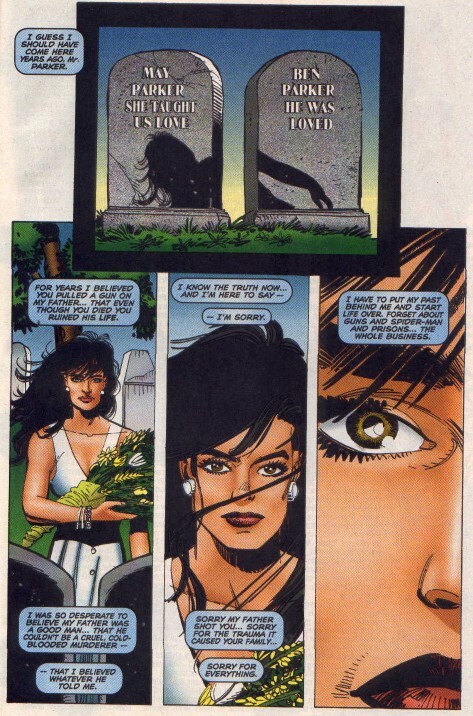 Seeing him with another woman (whom he isn't interested in, anyway -- this is Spider-Man, not Melrose Place). a hero. But I learned that when you get power, the responsibility to use it wisely is part of the package. maybe something good actually came from it. Thanks to that lesson -- Spider-Man lives on!" The fact that this happened in the middle of the clone fiasco didn't detract from a great story. You could just imagine this story happening if somehow Peter Parker was forced to go into hiding and take a joe-job with a new identity as Ben Reilly. 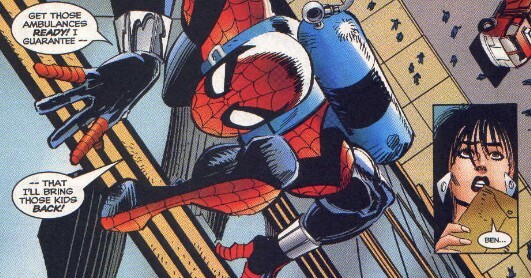 If you don't know what the Clone Saga is, don't fret. It's over now. There were several points that I liked about this story, but the main one was that although Jessica (the daughter) came from different roots, she was still able to learn the same lessons about power and responsibility that Spider-Man learned when Uncle Ben died. It's more of an upbeat ending when so many other Spider-Man stories had been trying to tear the hero down. Minor point here: Although I like the device of alluding to past great stories by using relations of the characters in them, it is starting to get overdone. First there were Gwen Stacy's (who has thankfully stayed dead) cousins, now the daughter of Uncle Ben's killer? Who's next, Crusher Hogan's niece? Overall Rating: *** 1/2, a good solid read with a few pitfalls.